Dear friends, a informative post (in a long silent period) just to say that we’re in Paris this week – and the following one – to start two very interesting new challenges. Since yesterday we’re presenting at the conference “Ignis Mutat Res: Penser l’architecture, la ville et les paysages au prisme de l’énergie” (November 24-25th) where the selected research projects for the homonymous call funded by French government will be presented. We participated in writing one of the selected proposal, and so we’ll partner with Elioth (Egis Concept), Shanghai Tongji Urban Planning and Design Institute, École Nationale Supérieure du Paysage de Versailles (ENSPV), Ecole Nationale Supérieure d’Architecture Paris-Malaquais (ENSAPM), École Nationale des Ponts et Chaussées (ENSP) in the [Re][For][Me] project. The aim of this two-years project is to create a new cartography of energy, where all the flows that make a city alive will be mapped and visually integrated. Our specific role is to develop a dynamic and interactive visual platform that will represent the city from the very (and wide) perspective of energy. The topic of energy in general is a very hot one (!) and we’re very pleased to work together with architects and urban planners to help them – and all the other stakeholders – to understand and represent the behavior of the cities of Paris, Milan and Shanghai in terms of energy flows. Next week (November 29-30th), the kick-off meeting of the EMAPS European project (Electronic Maps to Assist Public Science) will take place. We will work together with Fundació Barcelona Media Universitat Pompeu Fabra, Technische Universität Dortmund, Digital Methods Initiative – University of Amsterdam, Fondation Nationale des Sciences Politiques (Sciences Po), The Young Foundation – UK for the next three years in observing trough the Internet two main socio-technical controversies climate change and life expectancy. More precisely, the aim of EMAPS, in the domain of science-society interactions, is to get a better understanding of whether the web can provide a meaningful equipment to produce an enhanced interest of a wider public (i.e. scientists, journalists, activists, corporations or citizens…) in science and technology issues, not as receivers of information about end results of science, but as potential participants in science in the making. Our role in this project is to conceive visualization tools able to depict the form of complex social phenomena assuming that understanding a phenomenon means understanding its form and understanding the form means, also, to see and to visualize its data and information patterns. The main effort is to reveal and dynamically describe connections between people, politics, information and scientific issues. In the middle of these two kick-off meetings, on Monday the 28, I’ll be very pleased to talk about our work – and our vision/approach to visualization – at ENSCI Les Aterliers, where I’ll meet also some very good friends! The speech is scheduled in the evening, with the title “Macroscopes. 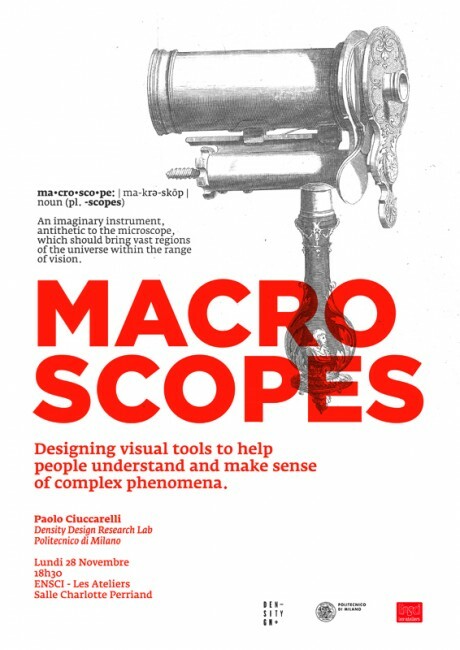 Designing visual tools to help people understand and make sense of complex phenomena“. A title that I actually like very much! We’re all very excited at DensityDesign for these new challenges: two great opportunities to improve our knowledge on the potential role of design in making the complexity of social phenomena visible, accessible and usable. It’s also a very positive sign, showing how very different disciplines are nowadays looking at visualization as a tool to improve their research/knowledge processes. Between infographics for the media-scape and visualization for Business Intelligence and fast analytics there is a huge territory to be explored, an extension of the scientific visualization domain where understanding is really the first goal: (economic) performances and the quest for attractive and glittering pictures only come after, if any. In this territory we believe designers have a fundamental role to play. We’ll try to keep you updated about these new projects via our blog.